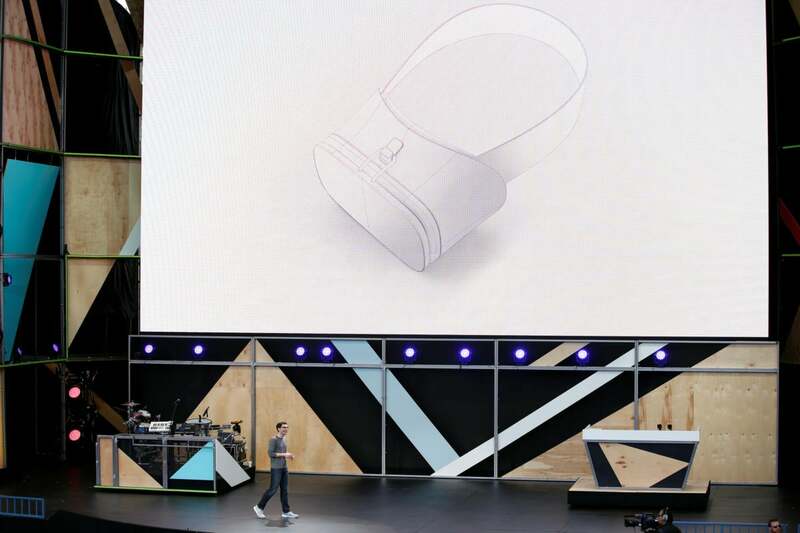 MOUNTAIN VIEW, Calif. -- Google on Thursday took the wraps off its virtual reality strategy at its I/O developer conference and gave enterprises a look at what could be their next marketing or training tool. The company on Wednesday announced Daydream, a platform for high-quality mobile virtual reality. Set to be released this fall, Daydream is focused on creating VR experiences on Android devices, though Google noted that "over time" it will be used for a variety of devices. "With Daydream, we've also created a reference design for a comfortable headset and an intuitive controller," said Nathan Martz, Google's Daydream product manager. "And, yes we're building one, too. The headset and controller work in tandem to provide rich, immersive experiences." Martz did not give a time frame for when Google would be able to put a headset and controller in users' hands, nor was a unit shown on stage or an image of a prototype. Daydream also is not yet ready, with no timeframe for when it will be. "I think virtual reality is going to be driven by mobile," said John Riccitiello, CEO of San Francisco-based Unity Technologies, which is working with Google on VR. "Twice as many people have access to mobile devices than PCs. It's just math." Advancing virtual reality technologies will enrich people's lives by allowing them to experience things they otherwise never would, Riccitiello said. "I don't think VR is going to be about games and simple shopping apps," he said. "You blink and you're in the Taj Mahal. You blink again and you're at 10,000 feet and soaring on the wing tips of a plane. Blink again and you're in a classroom taking a physics class from your favorite professor at Cal Tech or you're talking with your best friend 1,000 miles away but it's like you're sitting on the couch together." However, some at the developer conference said the company's work with virtual reality will go beyond chatting with friends and virtually visiting the Taj Mahal. VR could become the next big tool for the enterprise. "It's all going to be possible," Riccitiello said. "Think about shopping online except it will be social and you can try clothes on an avatar with your physical dimensions." Brian Blau, an analyst with market research firm Gartner, said enterprise executives, like most people, are still somewhat confused about virtual reality and augmented reality and what the technologies could add to a business. However, as they begin to figure it out, new possibilities will open up. According to Blau, the first uses of VR will likely be in marketing and real estate. Potential customers could use virtual reality to get a sense of space and place. They could use VR to take a next-to-reality tour of a property even though they're across the country. Dinesh Ganesan, a consultant with Octo Consulting Group, which works with government agencies, said his clients haven't asked him about virtual reality, but he will be talking to them about it. "They talked about a conference meeting. You want to have a real experience. We can talk from a remote [place], but we can feel like we're standing next to each other," he told Computerworld. "Maybe use this for training. They can build a simulator with a VR experience." Using virtual reality in areas such as corporate training or to teach workers how to use machinery, will be a big asset, even though VR is a consumer-first technology, Blau said. "Instead of flying somebody out to train them on a complex piece of equipment, have them use it virtually first," Blau said. "It cuts the time they have to be onsite. You could increase the amount of people you can train because you're training them 75% or 80% on virtual reality and 20% on actually being there." He also said VR could quickly be inserted into businesses like Airbnb, a website for list, finding and renting accommodations. "If you're on Airbnb and you're trying to rent a house for a $1,000 a week, somebody could do a VR walk-through of your house that's more realistic than a 3D walk-through on a PC," Moorhead said. "We're two years from 10% of businesses using VR, five years from probably 40% or 50%. They're going to see the cost savings. There will be a new bar in customer service. People will have bigger expectations."